A New Map of Louisiana with its Canals, Roads and Distances from place to place, along the Stage and Steam Boat Routes. 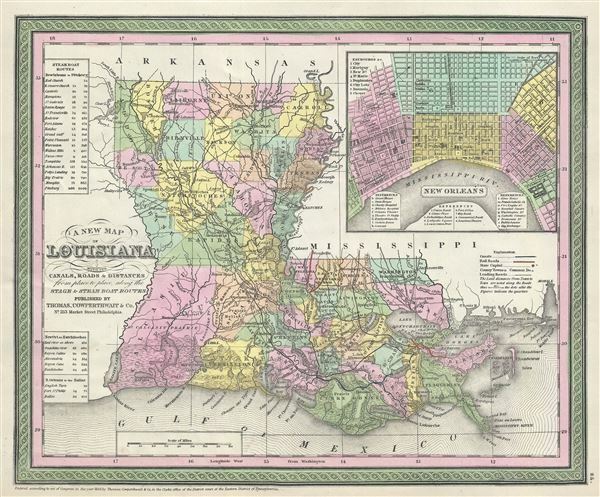 This is an extremely attractive example of S. A. Mitchell's 1854 map of Louisiana. It depicts the entire state color coded according to individual counties. Shows canals and roads with notations regarding steamboat and overland mileage. A large inset in the upper right hand quadrant offers a detailed city plan of New Orleans. Shows grid structure, districts, important buildings, piers and wharfs. Surrounded by the green border common to Mitchell maps from the 1850s. Rumsey 0537.025 (1849 edition). Phillips (Atlases) 6913-24.